Beginning of the end for Adam at Blackpool? 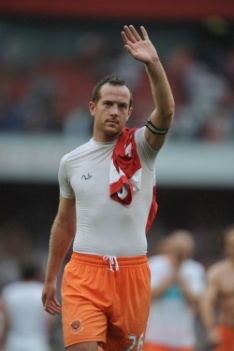 As the saying goes, all good things come to an end, and the picture emerging this week is that Charlie Adam’s days at Bloomfield Road look to be numbered. In addition to press reports linking the ‘Pool skipper with a move away, the news this week of complex contract wranglings only serve to reinforce the feeling that Adam might not be wearing the tangerine shirt for much longer. Barring his unusually poor performance at Birmingham last week, superbly analysed by BFC Blog, Adam has made the step up the Premier League level with ease. As the talisman of the side, Adam has won numerous supporters in the media, none more so than Jamie Redknapp. Concluding the Sky coverage of the 3-2 home defeat to Man City, Redknapp heaped praise on the Scottish midfielder, signalling Adam is set for a long Premier League career, even if the Seasiders are not. This is not necessarily anything new, and most Blackpool fans would accept that failure to stay up this season would inevitably result in the loss of the captain. It now appears however that his departure could be hastened, with a move in January becoming ever more likely. The story emerging this week of a reported unpaid bonus is a damaging one for the club, especially as Adam’s is supposedly a test case, with other players ready to take action should the ruling go in Charlie’s favour. Who is right and who is wrong is not for me to decide – only the parties involved know all the facts. Quite simply though, things should never have been allowed to get to this stage, and it is another embarrassing PR failure for the club. That the issue could not be solved internally by the club is a worry – it cannot be doing the relationship between player and employer any good whatsoever. Regardless of the outcome of the arbitration hearing on Thursday, no good can come of it. A ruling in favour of the club will surely the sour feeling among the whole squad, not just Adam. If the Premier League rule in favour of Adam, then the ramifications could be dire, with some quarters suggesting Adam’s contract could be deemed null and void, effectively enabling him to move on for nothing in the transfer window. Such a scenario seems far-fetched, but the contractual issues are not likely to persuade Adam to see out the season at Blackpool with a big money move on the cards in January. Should Adam leave in January, he will do so with the thanks of every single Blackpool fan, who surely recognise that he was the major key in the last season’s promotion. It should not however be assumed that everything will go to pot without him. In recent years many influential players have moved on, only to be replaced with new heroes. A like-for-like replacement for Charlie is hard to imagine, but there are several players waiting in the wings, such as Ludovic Sylvestre and Chris Basham, who will be looking to prove their worth. If Adam stays, then it will be a massive boost for the rest of the campaign, but with the vultures circling, I rather suspect we might have to get used to playing without him. If injury keeps him out against West Brom tomorrow, it will be a good test of how the Seasiders will cope post-Adam. At the start of the season, flicking through the fixture list you may well have picked this game out as a chance to pick up some points at home to a fellow promoted side. However, West Brom have started the season superbly and had a couple of well documented performances against Man Utd and Arsenal. From Blackpool’s perspective, there is a doubt over Charlie Adam’s fitness, but should he be fit then any changes in the team may come in midfield with Keith Southern’s return to fitness potentially pushing him back in to the set up to re-form last seasons successful midfield triumvirate, which Up The ‘Pool’s article suggested the other day. The front three are always up for debate as to which personnel will play there, however, the shape should remain the same. What should the Seasiders expect when the teams come out on Monday night? 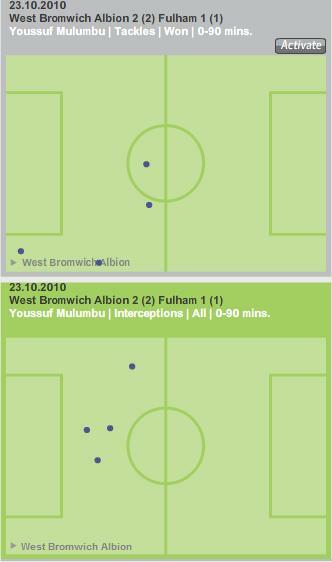 Looking back on West Brom’s previous performance against Fulham (at home bear in mind) it appears that they line up in a 4-1-4-1 (I have seen it described as 4-2-3-1 if Morrison advances and Scharner holds a deeper position), the last team to play that against Blackpool was Blackburn at Bloomfield only a few weeks ago. That game saw our formation being cancelled out in the middle as the spare man between the two lines of four is particularly effective at picking up any midfield runs. Against Blackburn a lot of the Blackpool play came down the flanks and this is something that will probably happen again. 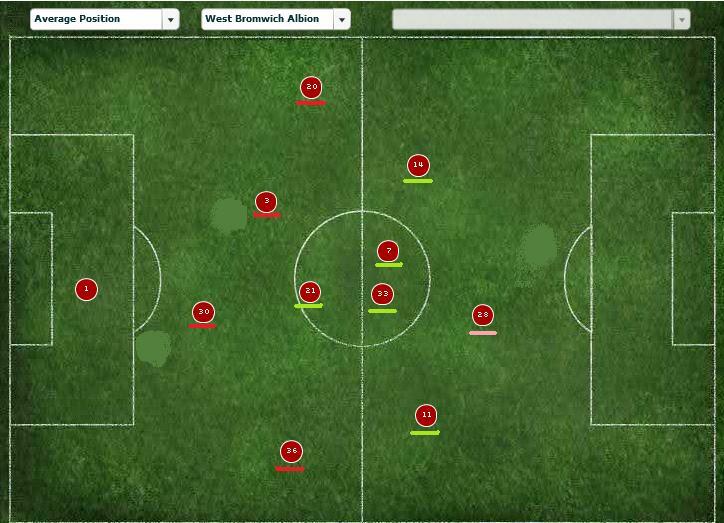 However, West Brom playing a 4-1-4-1 is executed in a different fashion from Blackburn so the attacking proposition from the Baggies will be vastly different. A quick look at the Premier League passing stats shows us that West Brom like to pass the ball, they have averaged 365 passes in the last two games to Pool’s 371. For reference, Stoke average about 200 and Arsenal about 500. They will look to work the ball in to the wide positions where they have the players who can cause the Tangerines some serious trouble. Defensively there’s nothing complicated with West Brom with a flat-ish four, looking at their average positions, the full backs aren’t overly attacking. 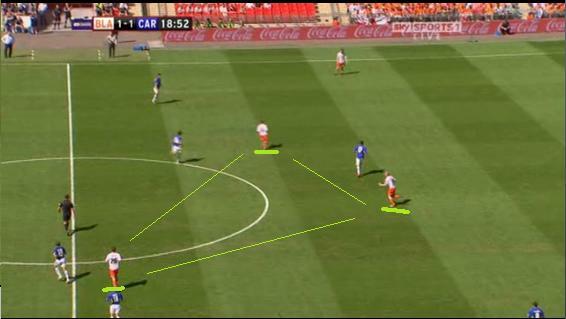 This will be crucial as Holloway loves to apply pressure to the wide areas in the hope of creating overlaps. If the full backs hold deeper positions then that should help to counter Blackpool’s wide threat. In midfield they have a midfielder in Mulumbu who sits in front of the defence endeavouring to intercept ball and break up the opposition plays with tackles. He was cited this week by the Guardian as a key reason for their success so far in so much as he has added steel to the West Brom team that some felt Mowbray’s Premiership team lacked. Looking at his chalkboards from the recent Fulham game then you can see his value to the team perfectly illustrated, he never missed a tackle and made 4 valuable interceptions in his own half. Just as Blackpool pose a threat down the flanks, so do West Brom and arguably the team that wins the wide battle will win this game. Chris Brunt has started the season superbly with 4 assists already this season, alongside this Jerome Thomas has chipped in with 2 assists from the flanks. Brunt is capable of excellent set piece delivery and isn’t afraid to shoot from distance. West Brom have started the season so well, but so have Blackpool. Both teams will be eager to win. Will West Brom feel the pressure of expectation due to that excellent start and will that be a burden that forces their players in to individual errors. One thing is certain, Holloway will send his players out to attack again. 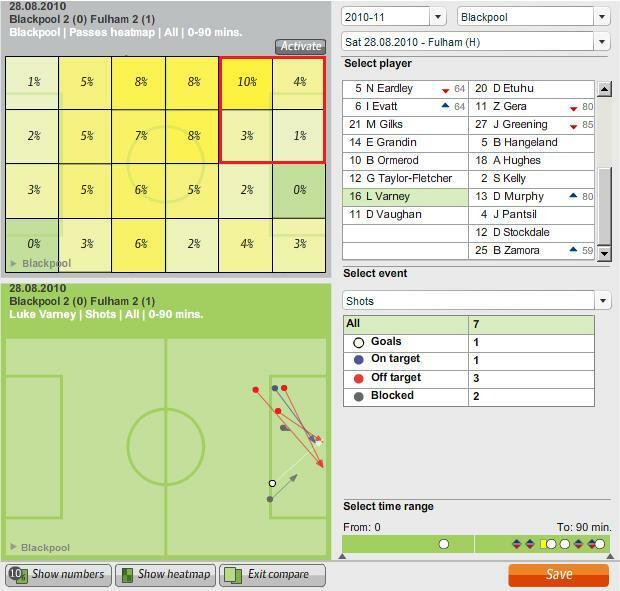 The key for Blackpool is the quality of the ball in to the box. Get that right and DJ Campbell will not be too far away from hitting the back of the net. A weekend without football feels strange, but it also gives me a chance to catch up on a load of posts that I’ve been working on for some time. I’m going all John Major with this and going back to basics, however, I hope it’s more than his nonsensical rhetoric and I won’t mention ‘Victorian Values’ at all, apart from that mention just then. First and foremost I want to get the basics set down before moving on to anything else formation or tactical based. Since day one, Holloway has set us up to play in a 4-3-3 which ‘on paper’ sets up as a flat back of four, a narrow line of three in midfield and a line of three forwards sat slightly wider that the midfield. I’m not gonna assume everyone reading this knows what a 4-3-3 looks like, but here it is on paper. 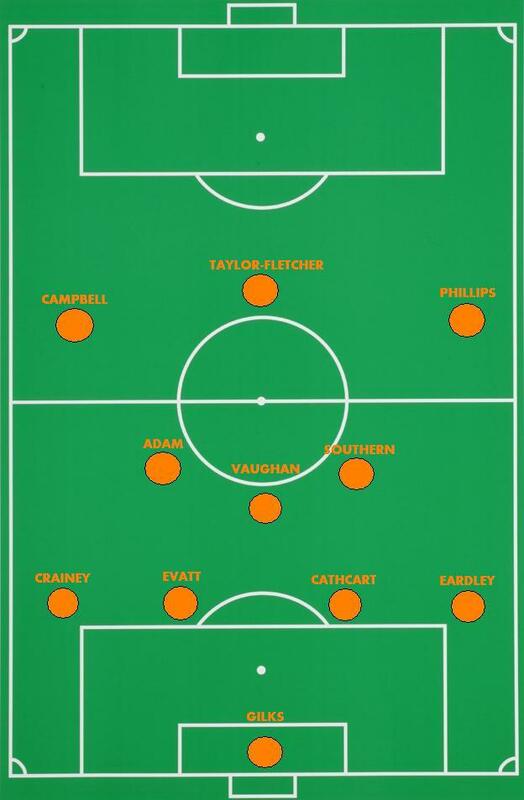 As with most football formations the ‘on paper’ outline is rarely how the team takes it shape when on the field of play and the same can be said of Blackpool. In possession, the formation morphs in to a 4-2-1-3 as the midfield line splits in to a triangle shape and when possession is lost then the formation sets up in to a slightly deeper version of the basic 4-3-3. If you take a brief look at any of our matches you can see the above patterns taking shape. Here I’ve pulled together a couple of shots from the play off final to illustrate this to back up my basic diagrams. The midfield trio without the ball are circled as they defend in a line in front of the back four. I have to say that I was really amazed when I first saw us play the 4-3-3 in the early days. In a pre season friendly against Everton I saw us line up that way for the first time and to be honest it was the first time I had ever witnessed a real life team line up with a 4-3-3. Until that Blackpool we were very much a 4-4-2 club as most English clubs are. By the end of that friendly I was unsure if this was just a pre-season experiment. By the next time I saw us play, it was clear that 4-3-3 was going to be our basic shape. And by the time I witnessed our 2-1 victory over Newcastle it was clear that Holloway was bringing more to the club than a basic 4-3-3. It was refreshing, vibrant and the players were given freedom to move and freedom to attack. The reasons behind Blackpool’s success last year cannot be wholly attributed to setting the players up in a 4-3-3 formation, however, it certainly did take a lot of teams by surprise, but it is more down to the way that the team played within the 4-3-3. As explained above, it is fluid in it’s structure, but as I will go on to say in my next few posts there are character traits of the 4-3-3 that I believe are crucial in making the formation a success. Continuing on from part one, I shall pick out my key observations from the next four games. Holloway admitted an error in picking Alex Baptiste in a defensive midfield role, a total diversion in tactics and a move that failed to pay off. 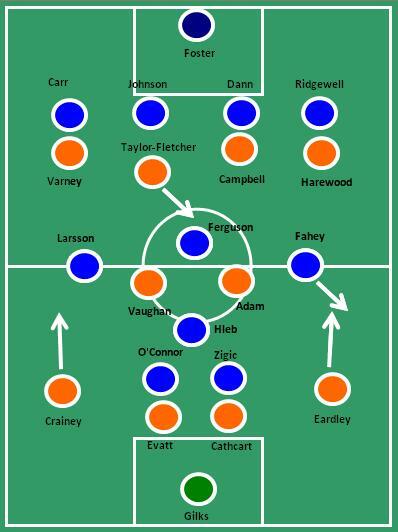 The formation reverted to the usual 4-3-3 in the second half and gradually Blackpool played more coherent football. In playing Baptiste in the defensive midfield role, Holloway would have hoped to to see Baptiste breaking up Chelsea in our half. However, a quick look at his interceptions and tackles proves that the gamble never paid off. One interception out wide right and one tackle won. It was a frustrating day all round and the less said about Charlie Adam’s own goal the better. However, one thing that Sam Allardyce is very adept at is getting his teams to work hard to ensure that the opposition play in to their strengths. This can be perfectly illustrated by taking a look at the passes delivered in to the Blackburn box. They want you to cross as they will no doubt (in most cases) win the aerial battle. 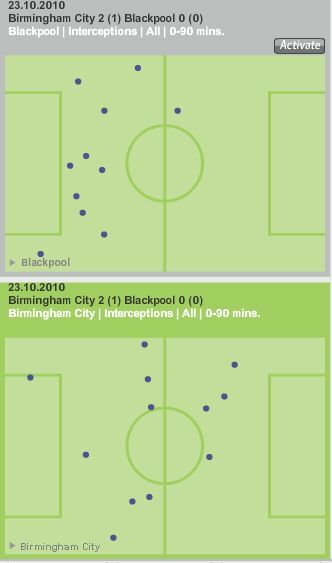 Looking at Blackpool’s crosses in that game, note how many were unsuccessful and also what poor angles they were hit from. Not one came in from the byline. Blackburn can defend this play all day long with Nelsen and Samba commanding serious aerial respect ensuring that only a quarter of Blackpool’s crosses hit the target. Going to Anfield and dominating the first half hour of a game is something very rare. Blackpool went and did that, Liverpool on the back of a Europa league game were somewhat put in to the shade by a dominant passing display in the first half an hour which culminated in Charlie Adam’s converted penalty. 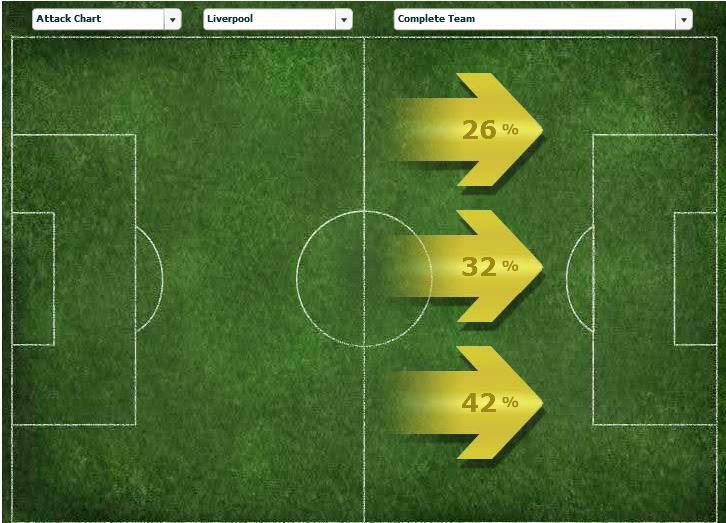 Here you can see the passing comparison between the two teams, Liverpool completed only 82% of their passes whilst Blackpool not only had more passes (132) than Liverpool, but completed 92% of them. 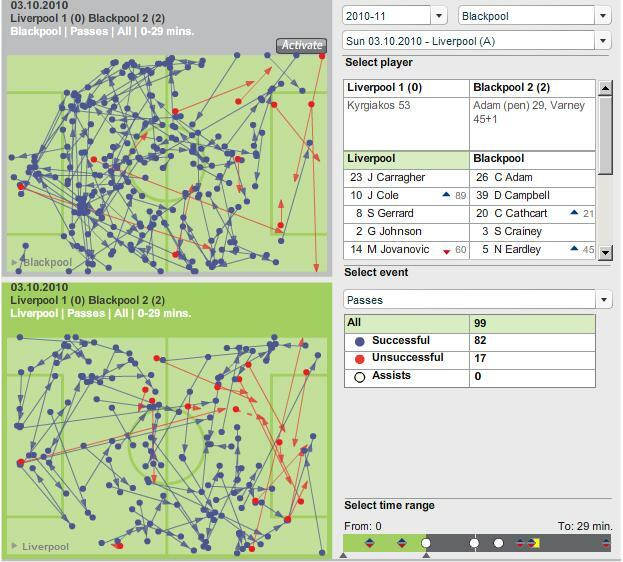 Another interesting point about the Liverpool victory is the way that Liverpool favoured their attacks to the right flank with Gerrard and Johnson pushing the play down the right, whilst Blackpool structured their attacks down the left. Was this a ploy to exploit the gaps left by Johnson at the back. Certainly the move leading up to the penalty would suggest that. Much can be said about poor refereeing decisions, however, bringing on a world cup winning creative midfielder whom it is rumoured they paid £29m for is going to help give your side an advantage. 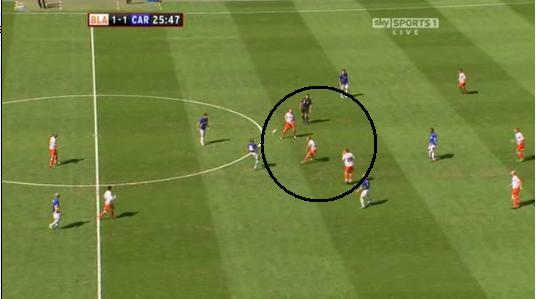 Silva came on and floated between Blackpool’s lines and ensured that ball was played in to the Blackpool box. Getting the ball in to City’s box proved more difficult and for all Blackpool’s passing, not one pass from open play made it in to the City box. The only box activity you see here are passes out of the box. 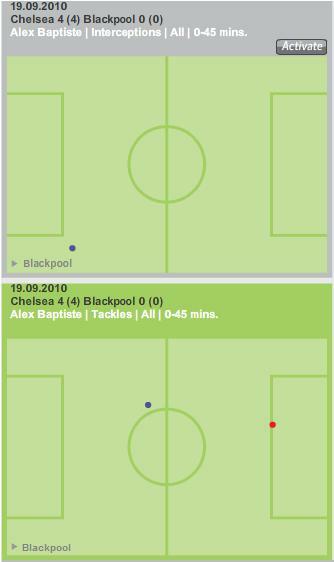 If Blackpool are to beat teams, they must start getting their passes in to the opposition boxes especially as DJ Campbell tends to thrive off balls in to the box (there’s a post coming about this). There you have it. Blackpool’s first eight Premiership games giving an idea of the factors that could have proved decisive in each game. What is sure about Premiership football is that Blackpool aren’t totally out of their depth and we as fans can tinker with great tools such as Guardian Chalkboards to analyse our matches. 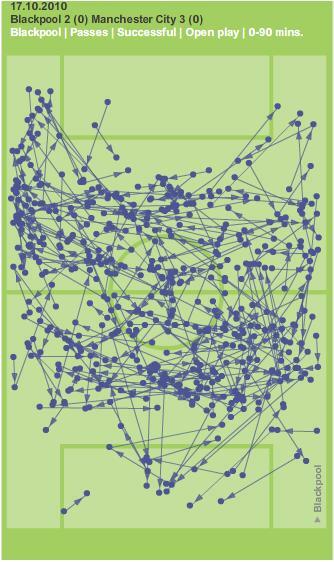 I wonder what the passing charts would’ve looked like if we had this available during Worthington’s tenure? 4-2-1-3, 4-3-3 or Something Else? Last season the 4-3-3 formation employed by Ian Holloway was a revelation. Most teams faced in the Championship lined up in the traditional, if rapidly unfashionable, 4-4-2. While it took some time to get used to, once the players were familiar with the system most opponents struggled to cope with the way in which ‘Pool attacked and the end of season form helped propel the Seasiders into the Premier League. Despite the success under this system, Holloway opted to tweak the formation and instead play a 4-2-1-3 for the opening game at Wigan, sticking with this formation for every game aside from the failed experiment at Chelsea. This was perhaps forced due to Keith Southern’s injury ruling him out of the first four weeks of the season – it’s hard to imagine that Southern would have been dropped for Elliot Grandin if he had been fit. Grandin has since dropped out of the side periodically however, with Southern yet to start in the Premier League. With the former Marseille player benched, it has been down to Gary Taylor-Fletcher to occupy the role behind the front three on two occasions, with little success – both games ended in defeat, to Blackburn and Birmingham respectively. Taylor-Fletcher has handled the step up to the top flight very well in my opinion, but has been noticeably less effective when playing in the more withdrawn role. Below you can see how ‘Pool lined up against Birmingham on Saturday. As I wrote on Sunday, Marlon Harewood struggled out on the right, with the side often being overrun when defending. Following two disappointing results, it appears likely that Holloway may now choose to change not only personnel, but the system too. Ian Holloway has come out and said that different players may be given a chance, mentioning Southern and Ludovic Sylvestre among others. It doesn’t take a genius to work out that a place in the starting XI for Southern or Sylvestre would mean a different formation, as neither David Vaughan nor Charlie Adam are likely to be dropped. 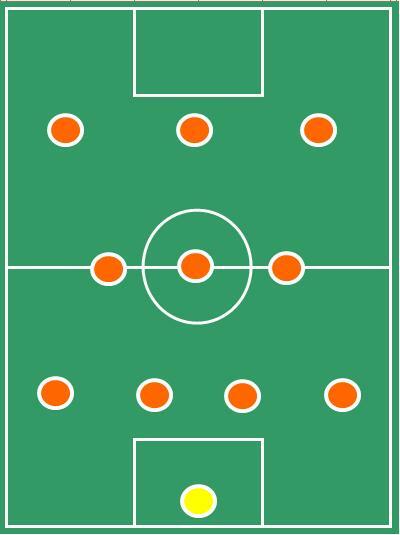 See the below diagram for how I expect Holloway to set out his side against West Brom. It seems inevitable that Keith Southern will now get his first Premier League start and I can see him being reunited with his midfield partners from last season, Vaughan and Adam. The extra bite that Southern offers may be what the Seasiders require to be more combative on their own pitch. Elsewhere, following impressive cameos from the subs’ bench, Matt Phillips could well earn his first start. Phillips’ defensive awareness might not be the best just yet, but with Southern tucked in midfield giving the ‘Pool backline more protection, it will give Phillips more licence to do what he does best…attack. With a wealth of attacking options at his disposal, Harewood may have to settle for a place on the bench after his disappointing display at St. Andrews, while Luke Varney’s strong run in the side may come to an end. DJ Campbell is hard to drop, despite his mini goal drought, and Taylor-Fletcher would be the sole aerial outlet in the above scenario. Then again, Holloway could throw us all a complete curveball. The manager has done it before, and I certainly wouldn’t put it past him again. Sylvestre, Chris Basham and David Carney have all been unlucky not to make an impact since their arrival, and with the promise of changes from Holloway, it may be their chance to shine. Similarly, Dekel Keinan was probably unlucky to be dropped after his performance at Anfield. So many options…who’d be a manager? After my first match report from the Birmingham game, I want to run through the previous eight games picking out my key observations from each game to give an insight in to why I think we won, lost or drew the games. Blackpool have started the season admirably and have already scored some memorable victories, should this start be sustained then survival in the Premiership may become a reality. The season started with a match up against a Wigan team under the stewardship of Roberto Martinez whom Holloway learned a lot from during his sabbatical. However, Martinez will have learned that taking your chances is a crucial part of winning football matches. Looking at the chalkboard below you can see that Wigan generated the most chances, but Blackpool took the points as they converted four of them. Wigan could point to a poor performance from Chris Kirkland as the reason for this as he endured an awful game at the Dee Dubya. Hard to put much down about this performance that hasn’t already been said. Going down to ten men so early in a game (31 mins) against one of Europe’s best sides is only going to lead to one outcome. That we all know. 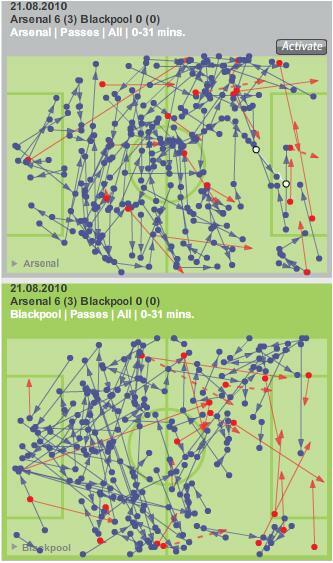 However, up until the sending off a look at the passing stats shows that Blackpool were certainly seeing as much of the ball as Arsenal with 129 successful passes to Arsenal’s 138. Premiership football came to Bloomers with a pulsating game that was marked by Luke Varney’s inspirational debut. 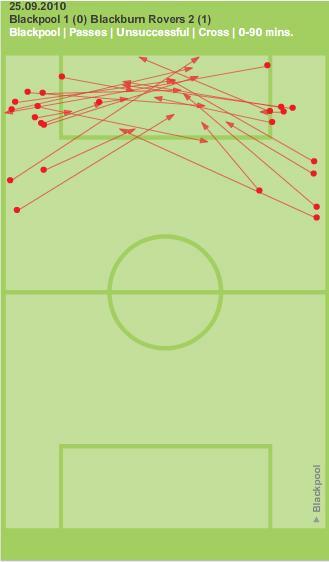 Blackpool’s passing was focused down the left hand side of the pitch that Varney occupied with the majority of the passing in the final third coming through the left side. 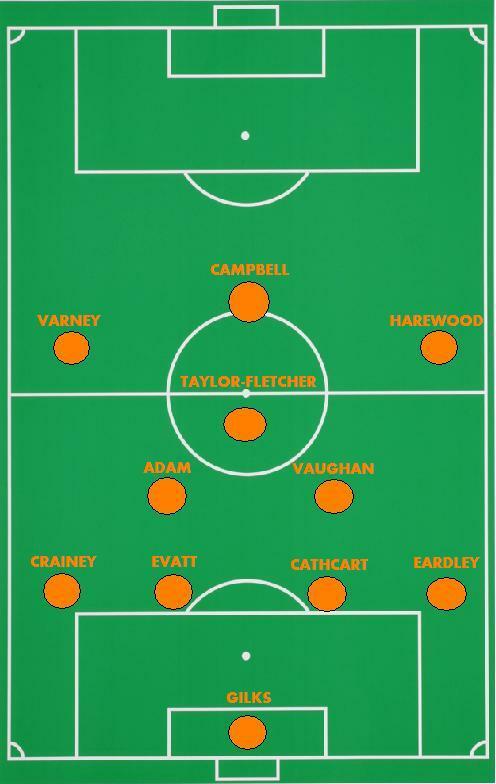 Added to this Varney was fearless when it came to shooting accounting for seven of Blackpool’s sixteen shots throughout the match, Ormerod on the right side got one unsuccessful shot away. 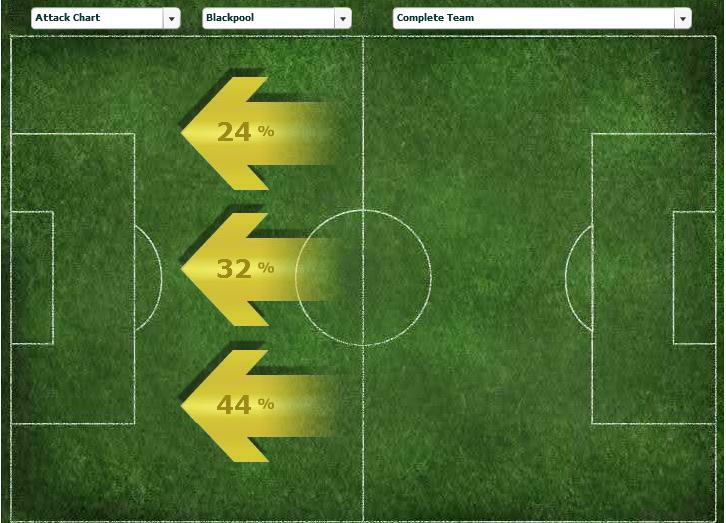 A look at Blackpool’s attacking chart again shows how much of the play was focused through the left. Oh, and Varney scored one and forced an own goal. Not a bad debut, and one that inspired the players around him to gravitate the play around him. A great result for Blackpool, some great passing moves and breakaways. Newcastle seemed to rely on the high ball to Andy Carroll who played at the head of a 4-4-1-1 formation, however, Kevin Nolan was expected to feed off Carroll’s headers and set up attacking plays. You can see the problem here, Nolan was largely wasteful in possession. 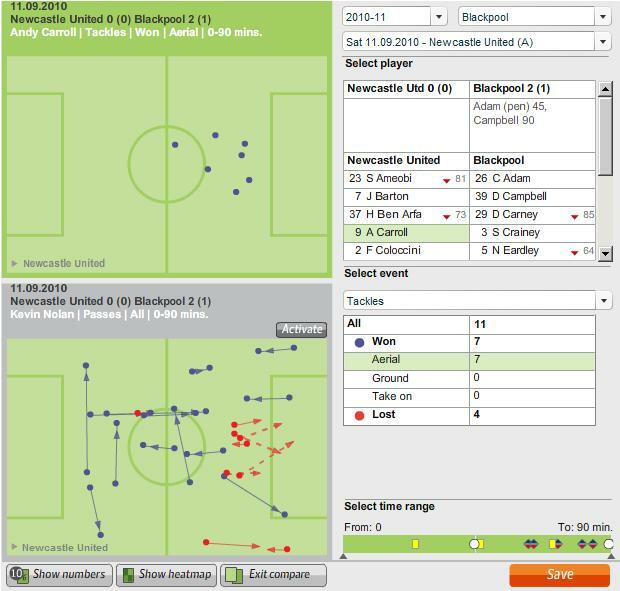 Blackpool knew that if Carroll was to win his aerial duels that they would have to be quick to intercept the ball when it came down, you can see that Blackpool made 50% of their interceptions in the zone that you’d have expected Nolan to be operating in. Those are my quick insights on the opening four games of the season, the next four games provided tons more excitement for Tangerine fans and I shall post some more snapshots from those four games and maybe a little more depth about a wonderful performance at Anfield. The match against Birmingham wasn’t billed as the meeting of two ex-Glasgow Rangers midfielders, however, at the end of the day Barry Ferguson showed Charlie Adam who was best on the day, which proved to be a critical factor in the outcome of this match. Games are so often won in midfield and with Ian Holloway setting up with an unfamiliar 4-2-4 formation Blackpool’s midfield struggled to get their passing together as they moved away from their usual midfield of three. 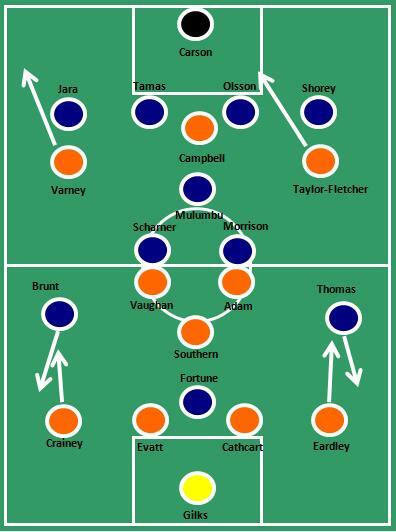 McLeish set his side out in a 4-4-2 with their two central midfielders split, in front of and behind Blackpool’s central midfield two in a diamond, something that caught Holloway by surprise. If you look at the passing performances of Adam versus Ferguson then there is only one clear winner with the latter never misplacing a pass all game. A lesson for Adam to learn from. 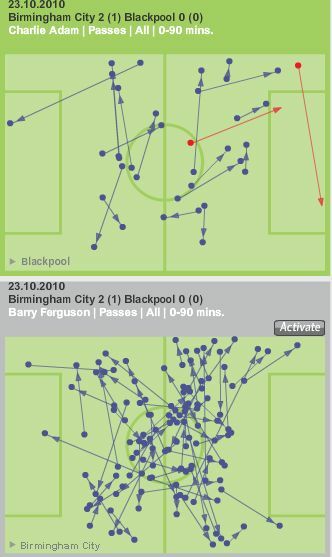 In fact Blackpool’s two key midfielders only had 51 successful passes all match and were still some way behind Ferguson. Another key to the Birmingham victory was the closing down they applied to the Blackpool players and you can see that they forced home interceptions high up the pitch whereas Blackpool failed to enjoy the same amount of success. Birmingham made ten of their 12 interceptions in the final third, whilst Blackpool could only make two. 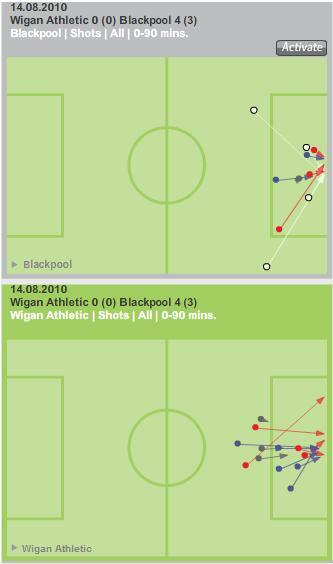 Another point to note is the way that Blackpool struggled to win ball distributed from the back. Matt Gilks when giving the ball short was perfect, however, the moment he kicked long Blackpool struggled to win the ball high up the pitch. Ten of his fourteen goal kicks failed to find his own player with Ben Foster only letting five of his nine go astray. 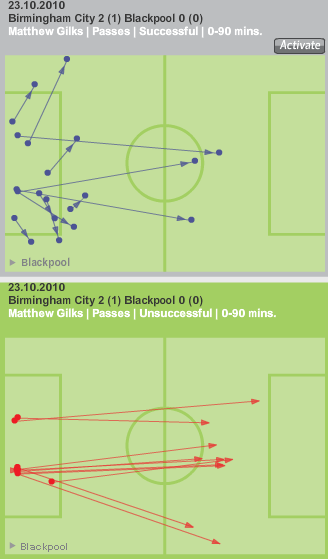 Gilks’ distribution has already been raised as a key earlier this season by UpthePool. So Charlie Adam’s former captain at Rangers Barry Ferguson showed how to pass the ball with accuracy and placed value on retaining the ball which allowed Birmingham’s midfielders to win the day. Blackpool’s start to the Premiership season has been characterised by strong midfield performances, today the formation change seemed to upset their rhythm and something it seems Ian Holloway will be keen he and his team learns from.